Chances are if you ever called our bank (either branch) you heard this cheerful voice asking if they could help you. That voice belongs to our Miss Mary. She started at the bank July 15, 2012. The bank was going to be her retirement job, however, she made it into so much more. Miss Mary sits in the front of our Mountain Iron branch. She was the first face you saw when coming in. Often times you would hear her ask people about their family, she would call their children by name and the majority of the time she knew the names of their grandchildren. She was delighted to see the customers when they walked through the door. When you left the bank after a visit with Miss Mary, you felt that warm caring feeling, the feeling that the world is a little bit of a better place. Miss Mary has always been the first one to volunteer and to push herself to do just a little more. Her retirement job was important. She believed, the people, deserved the very best in customer service and she definitely strove everyday to deliver. Miss Mary’s kindness did not stop with the customer, she showed that side to her co-workers, always there with a shoulder and a hug. She cheers us on when we are successful and never forgets any single one of our birthdays. It is with some sadness, but lots of happiness, for Miss Mary to announce her final retirement! Of course, she does know, if she ever comes back out of retirement, she will always have a home here at the bank. 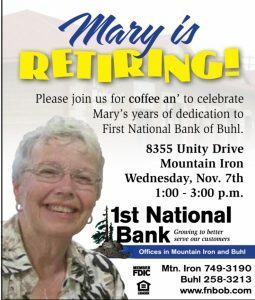 On November 7, 2018 we will celebrate the wonderful contributions that Miss Mary brought to the bank with cake and refreshments from 1-3. The public is invited to stop in, have cake with her and wish her well in her retirement. If you know her please stop by, you will be glad you did. Miss Mary, you have been the face and voice of FNBOB for so long! We cannot express our gratitude for all you have done to help us achieve the best customer service possible. You led by example on how to be kind to one another every day. Thank you so much for all your hard work and dedication!